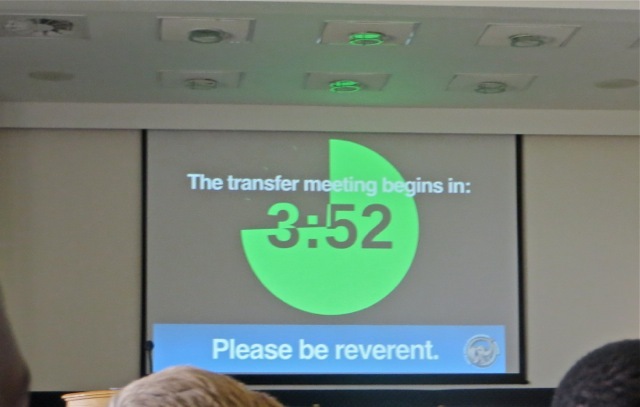 Tuesday was transfer day. I wish everyone could have a chance to attend a transfer meeting. 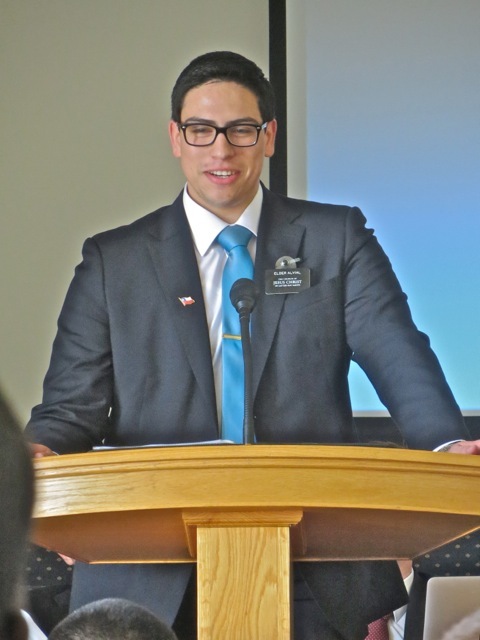 It usually starts with either the arrival of those missionaries who are leaving or those who are arriving meeting with the mission president and his wife. 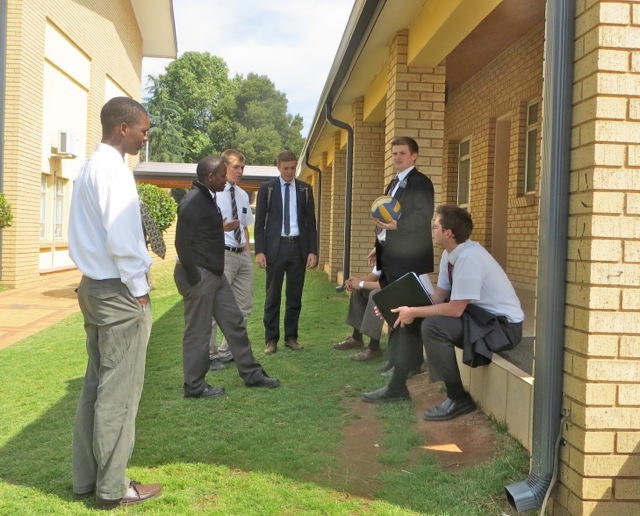 In the Johannesburg mission most of the missionaries who are coming in are in the MTC which is on the same grounds as the Mission Office. 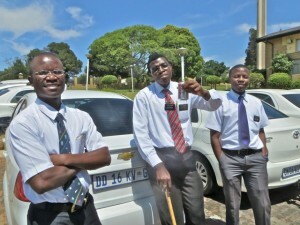 So only occasionally are any arriving missionaries met at the airport. 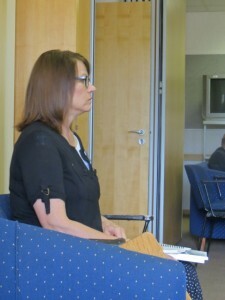 On Monday afternoon the departing missionaries come into Joburg and spend the evening at the mission home. 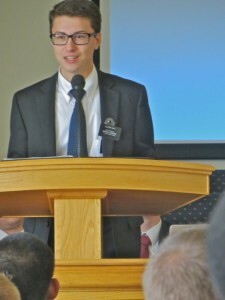 President and sister Dunn’s blog (http://dunnsinjoburg.blogspot.com) has pictures and comments about the evening and it is worth visiting. On Tuesday morning the new missionaries leave the MTC and spend a few hours getting oriented by the office staff and interviewed by President Dunn. 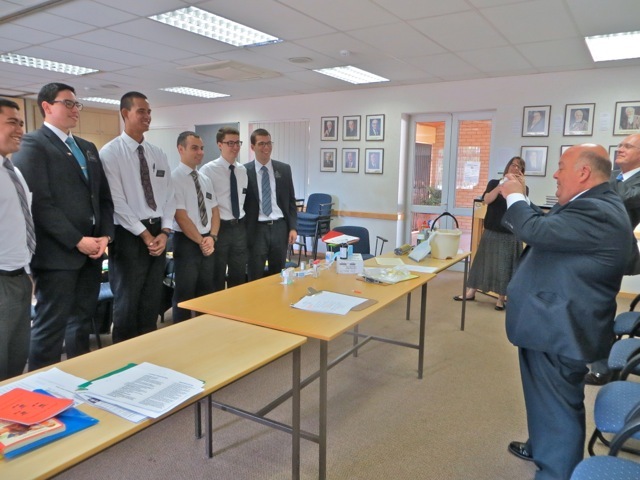 It is only after these interviews are the final decisions about which of the elders who having been selected as trainers will train which missionary. 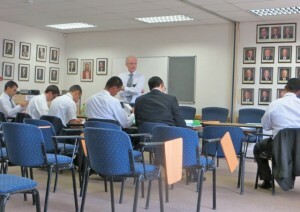 While this is going on the elders who are involved in transfers start to arrive from everywhere around the mission. 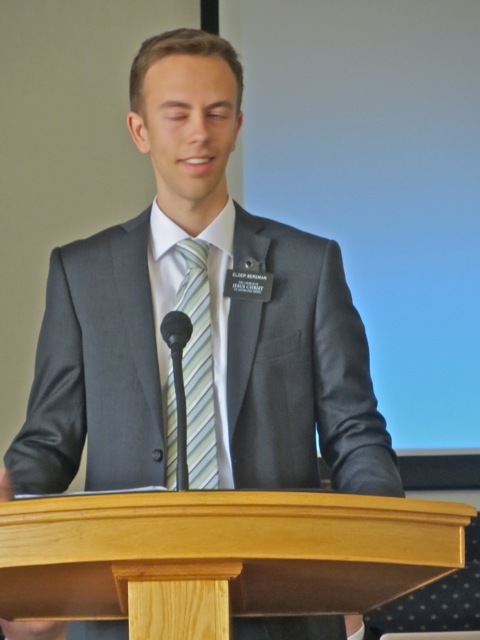 Those who had to drive 4-5 hours probably came in last night and stayed with other missionaries. 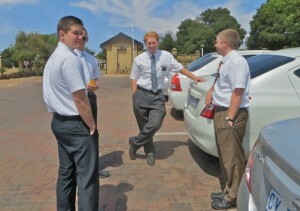 The APs are there early to welcome the new missionaries who are in getting oriented by the senior couples. Elder Mayende with elder Otieno and a friend. Elder Otieno is being transferred so elder Mayende will soon have a new companion. 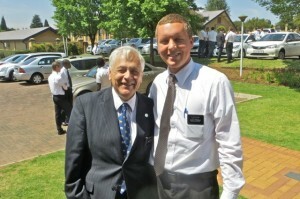 Elder Hallman is much taller than our friend elder Rogers who served in Ikageng with elders Bird and Kelman. 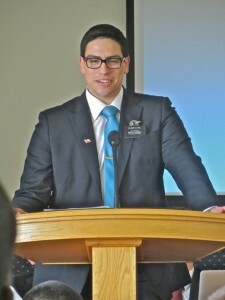 Once again elder Johnson showed up at transfer meeting. I have mentioned before that I think we have seen elder Johnson, with the great looking red hair, at just about every meeting we have gone to in Joburg. 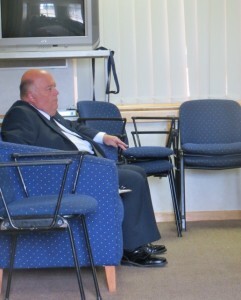 He was not being transferred or getting a new companion. He just needed to bring another elder in for some medical attention. 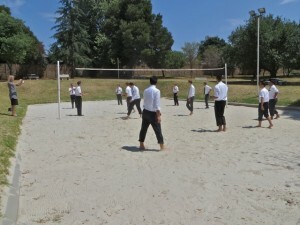 Then after the traditional volleyball game which was one for the first time ever by the arriving missionaries, everyone gathers in the chapel for the transfer meeting. 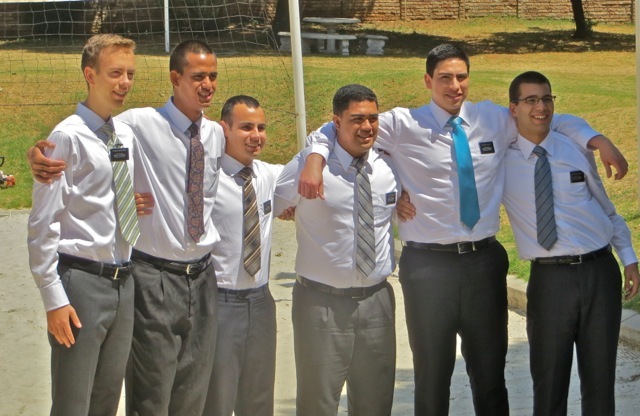 Although only 4 missionaries were leaving and 7 coming in, 39 – I think that is right – companionships were involved in the transfer. This is because district leaders, zone leaders, and even APs are reassigned as the spirit works through the mission president. All of the presidents we have served under have mentioned how often that near transfer day in the middle of the night he would wake up and feel a need to change the transfer board – the board on the left is what the mission is like before the changes. Sometimes this happens just the night before the actual meeting. 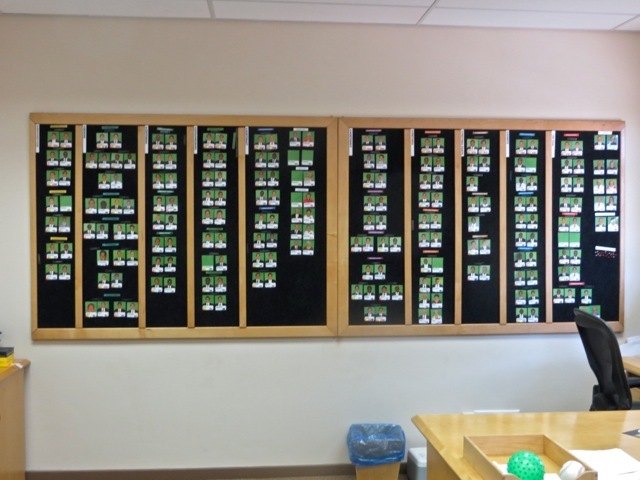 I remember one time when it looked like the board was ready to go and then the APs came back from a meeting with the president and put it back as it was before any transfers and the whole process started again from scratch. 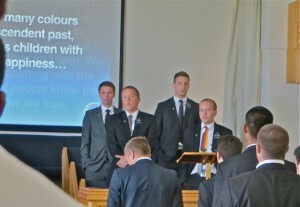 The arriving elders are given an opportunity to bear a short testimony. 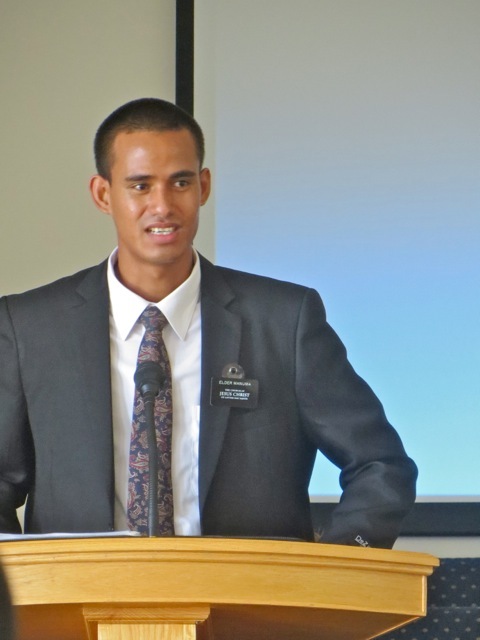 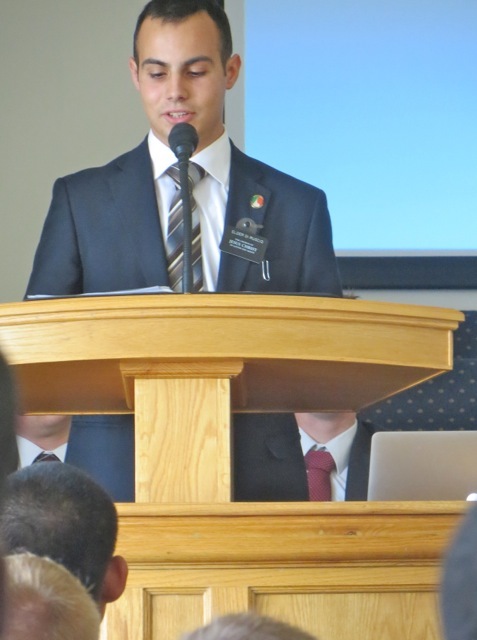 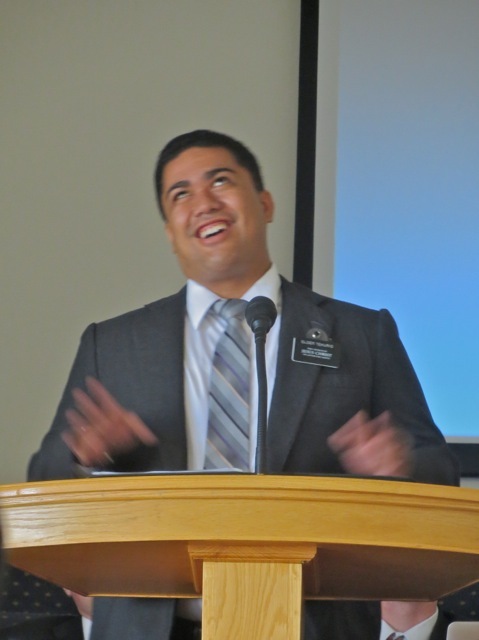 Elder Di Ruscio comes to South Africa from Italy, while elder Manuma is from beautiful Samoa. 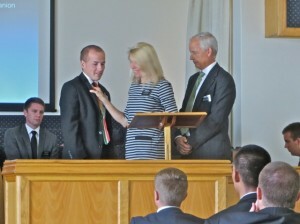 Elder May is the only new missionary from the United States. Elder Santoro is also from Italy. The final new missionary is elder Tekurio is from French Polynesia and knew no English when he arrived at the MTC three weeks ago. 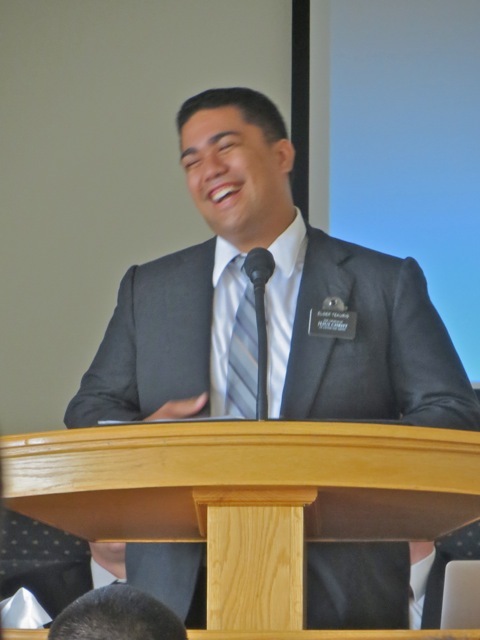 However he has a great spirit about him and I am sure the Lord will help him become proficient so he can share that spirit and testimony with those he teaches. 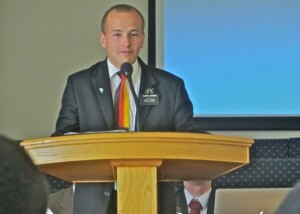 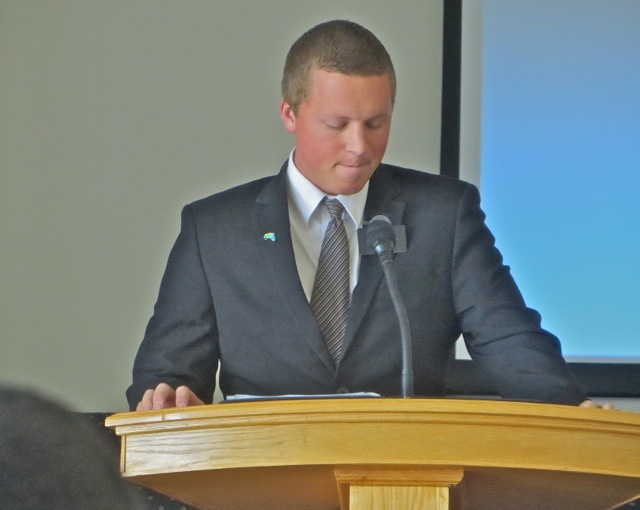 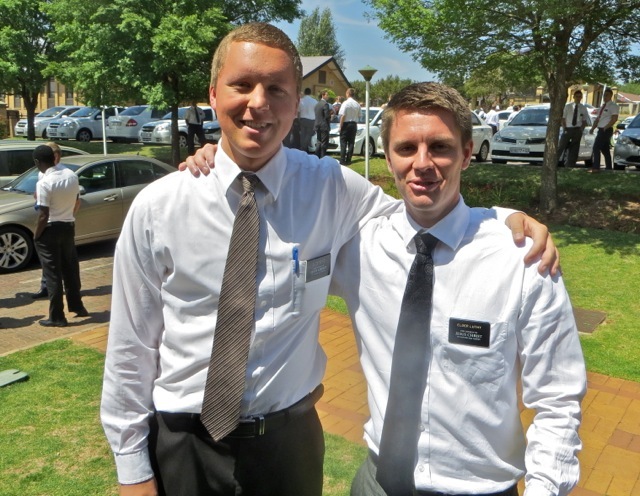 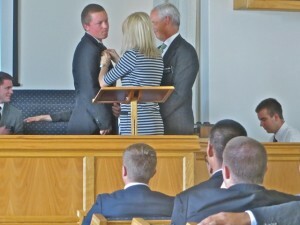 In the heading I mention that it is our final goodbye to elder Lohmann, but elder Benjamin Bird was serving in Ikageng when we arrived here and it was also time for him to be released. Before the meeting I took a picture of him with elder Luthy, another missionary who was being released. and then there is one final one of the two of us. 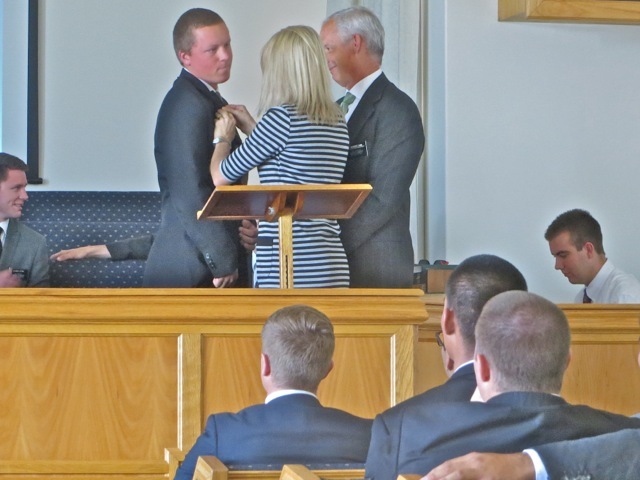 After all the new companionships are displayed, the departing missionaries get ‘pinned’ with a well earned South Africa pin by the mission mother and a hug from the mission president. 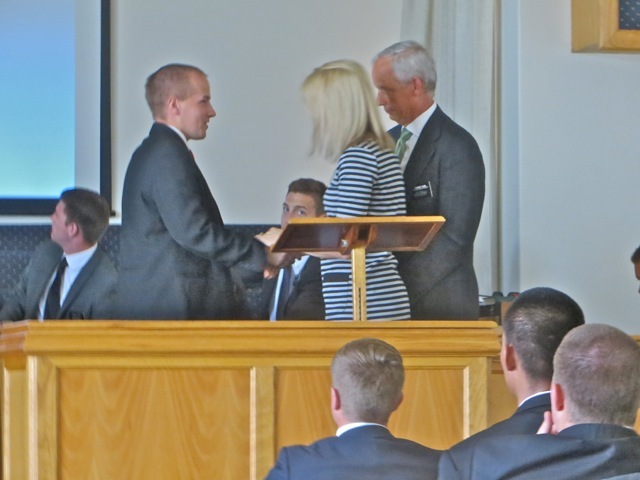 Then a final farewell testimony before the mission song is sung the prayer given and the meeting is dismissed so the missionaries can move all their bedding and other gear from one car to another and after more pictures, hugs, etc. 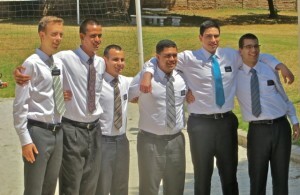 the leave for their new areas with new companions. These are the last pictures of elder Lohmann. 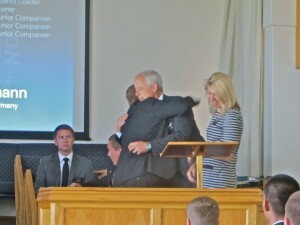 He gets his pin and hug, shares his testimony, sings the mission song for the last time as a Johannesburg elder, and one final picture with us before giving him a big hug and wishing him God’s speed. 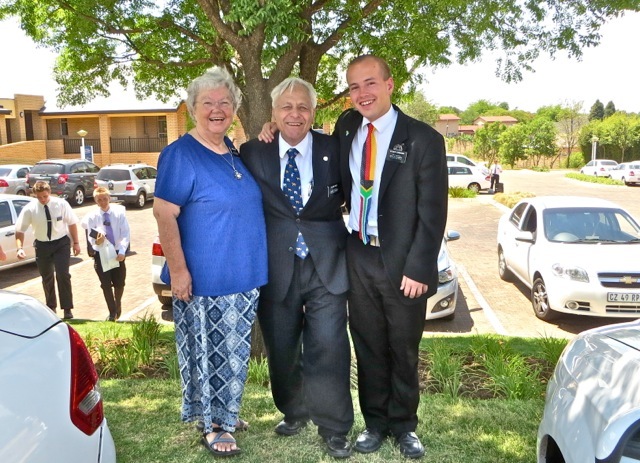 We then got into our car and drove back to Potchefstroom filled with a special spirit that comes from spending about 4 hours with some amazing missionaries. 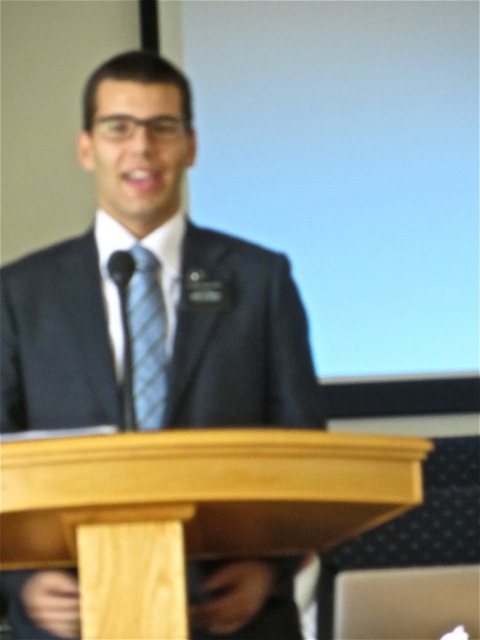 I will post the new companionships next Monday or Tuesday after the missionaries have a chance to write home to tell their families about the changes. I do not want to take any of the surprises – and there were some – away from the missionaries. 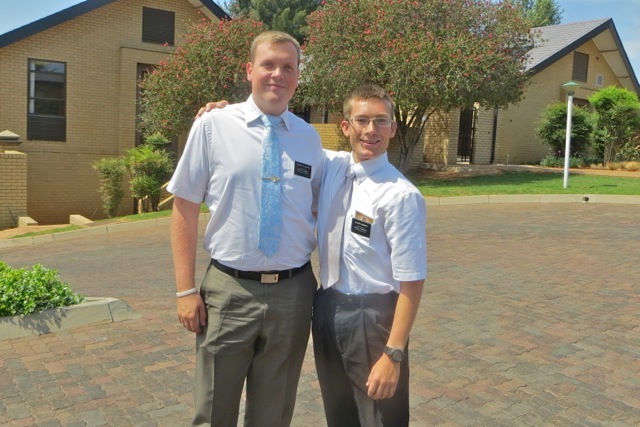 This entry was posted in Johannesburg Mission - Back To Africa on October 15, 2014 by Bill.